Mary, on one side, is crowned, with a halo. She holds the infant Jesus, with a cruciform nimbus, on her left arm. He blesses with His right hand, and holds a globe in his left. Mary is seated on a throne between two pillars, and is being carried from left to right by two clerics. Tow tiny figures are kneeling at her feet. 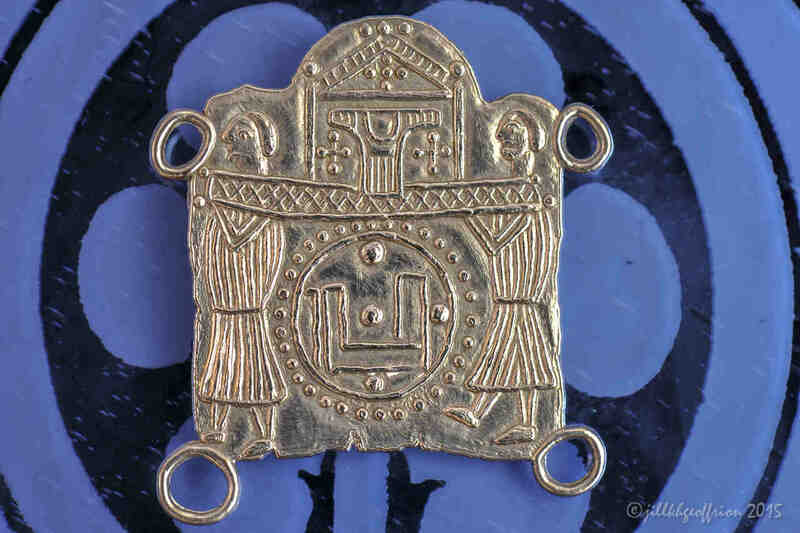 On the reverse side two bare-headed and tonsured clerics are carrying a reliquary containing the Sancta Camisa, the sacred tunic* that was believed to have been worn by Mary when she gave birth to Jesus, and given to Chartres Cathedral by King Charles the Bald in 876. Beneath the reliquary is a medieval Chartres coin, known as a “besan”, and which is still part of the city’s heraldry. The medal is a copy of one found in 1862, at the Pont Notre-Dame, when the Seine River was dredged, and is an exact copy both in design and dimensions. 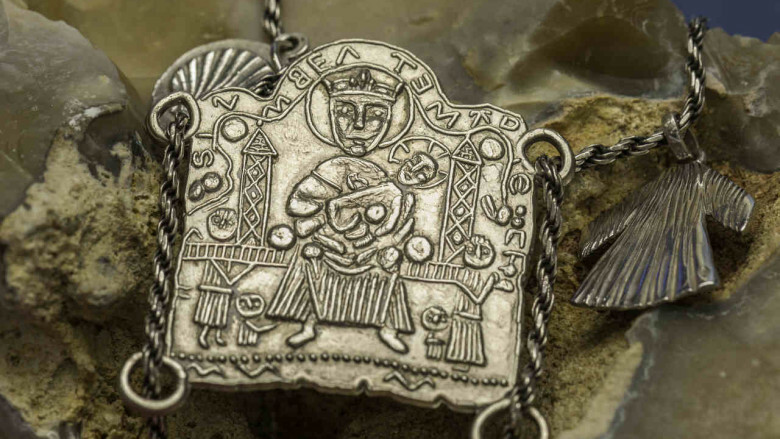 In medieval times pilgrims sewed the medal on their hat or clothing, or wore it around their neck on a leather chain. It is a fine example of medieval craftsmanship, and was for the pilgrims who flocked to Chartres to seek Mary’s intercession; many of them on their way to Compostela via Chartres. We have reproduced it for our modern pilgrims, who in the footsteps of centuries of earlier pilgrims, now come from all over the world. For those who enjoy history, it might be a pleasant souvenir of their visit to Chartres.